They tend to droop and get weighed down by lunching squirrels. 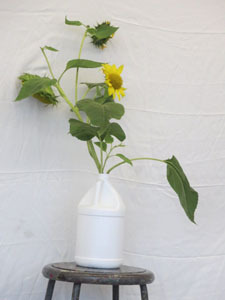 I cut down the tallest sunflower in my garden and brought it to drawing class. 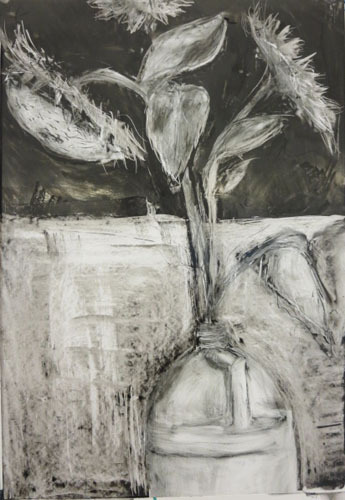 As a still life subject the tired sunflower offers lots of issues to work on: negative space, dynamic composition and the opportunity to practice energetic markmaking. But the greatest of these, hmm, is the problem of wanting to draw a flower as a flower, meaning pleasing and pretty. It’s a glorious, assertive flower. But, alas, it’s dying. 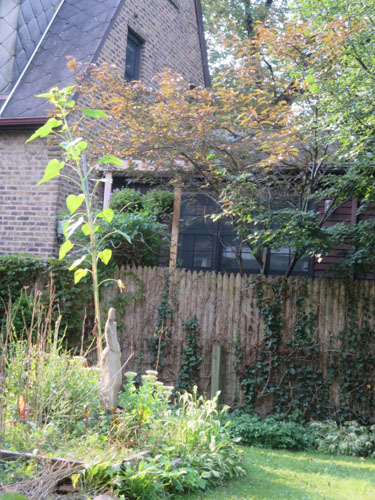 The glorious and assertive, but dying sunflower must have touched a nerve in Van Gogh. He painted it, many times, in all its raggedness and made it famous. You can’t go to the farmers market in early fall and not sigh ah-look-so-Van Gogh. Twenty years later, Egon Schiele also fell for its decadent charm, celebrating decay even more than Vincent had done. The two decades bracketing the year 1900 brought great cultural change. The 19th century was giving way to the inventions of modernism in every field you can think of, in the sciences and the arts. It was an exciting time to be alive and alert. 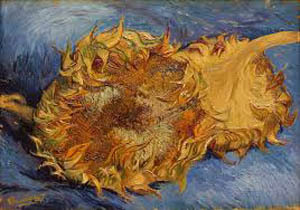 In Van Gogh’s Sunflowers we see the decaying half of the change. 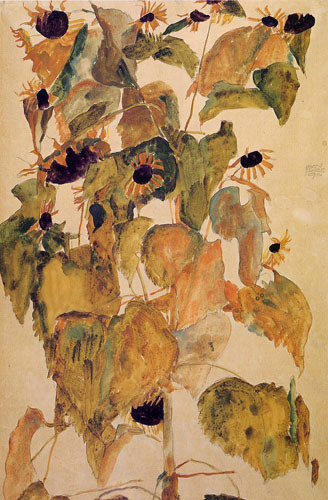 In Schiele’s Sunflowers we see vitality and strength, in the midst of decay. 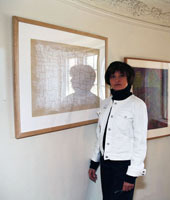 One student in the drawing class worked in a technique that held maximum potential to convey the dynamism of the dying sunflower. It’s a difficult subject, technically and emotionally.